I had a much more limited holiday in the San Diego area this year, leaving me only about a day and a half to play in the hills. I decided to give the P1K list a bit of a rest and went back to some unfinished business with delisted summits from the local Sierra Club list. Three of these are located along a stretch of Interstate 8 in the Cleveland National Forest. An unnamed fourth summit is 2ft shy of a P1K, one I had unsuccessfully tried on my most recent visit. All of them were roughly 5mi RT, mostly on trail. 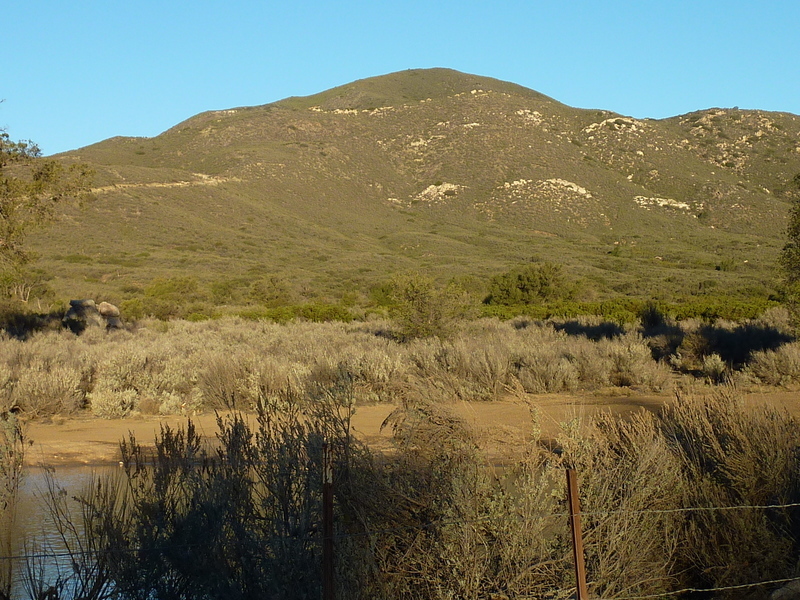 The terrain in this part of the county is rocky, rolling hills covered in chaparral, often impenetrably thick. Things are not so grim as they might be, however, as there are ample use trails and other paths cut by individuals or groups for purposes of illegal immigration, peakbagging and rock-hounding. All four summits had unmaintained trails for portions near the summit, making what might otherwise be some scratchy bushwhacking, far more pleasant. I was pretty tired by the end of the fourth one and was feeling out of shape - until I realized later the four made for a total of some 20mi and almost 6,000ft of gain. It was a good day with fine, clear skies and temperatures in the 60s and 70s - your typical SoCal in wintertime. Buckman forms the west side of Cottonwood Valley through which the PCT travels. The summit is most easily reached via a Forest Service Rd (16S12) off Buckman Springs Rd on the west side of the valley. The road is gated a mile from the pavement allowing closer access, but low clearance vehicles ought to park on Buckman Springs Rd as I did, or just inside the first open gate where there is a large clearing. The first half mile of hiking is easy, flat road before beginning to climb with progressively more eroded roadway. Past the first mile and the second locked gate one joins with the trail system that is the Corral Canyon/Bear Valley OHV area. Motorcyclists frequent the road that passes Buckman on the east side. At a local highpoint where there is a good view of the east side of the summit, I spotted what looked to be a use trail heading up from the OHV road. This turned out to be a decent use trail, a network of trails really, connecting a number of prospects found scattered about the east side of Buckman. The takings appear to be mica and other crystals, but I didn't come across any interesting specimens in my casual perusal. I was happy to find that I could follow this network of trail through medium-heavy chaparral to within a few hundred feet of the summit. Above this I had only 10-15yds of mild bushwhack before finding more open and easy cross-country the remaining distance to the summit. I had come prepared for more significant bushwhacking up the south side as per the beta I had from Brian Browning, but I was happy to find this nicely provided route up the east side. Next to the benchmark there was a messy register with brittle paper scraps, evidently a fairly popular summit. I signed my name under Brian's but didn't bother trying to photograph the haphazard collection of names. The most interesting view was to the northwest where Long Valley Peak rises higher still, less than three miles distance. It appears to have a steep, rocky South Face. North and east are the Laguna Mtns with views to the south stretching into Mexico. The route up was so much better than expected that I didn't try to find an alternative and followed it dutifully back to the start, taking less than 2hrs for the roundtrip. Long Valley is the most interesting of the summits I visited this day, its summit almost qualifying as class 3 with a rocky, cliff-like South Face visible from Buckman. One could hike the motorcycle trail between the two to make a longish hike, but it's somewhat shorter to make a separate hike of it, starting from the Bear Valley TH to the north, just off the Pine Valley exit on Interstate 8. This TH is one of the main entrances to the OHV area - I found six cyclists preparing to ride when I entered and a family of ATV enthusiasts setting up when I returned. Evidently they don't get many hikers on the trail here - upon my return one of the ATVers mentioned that word had been passed that a hiker was on the trail, as though that were most unusual and cause for concern. I suppose I should be happy that they were taking extra precautions when coming around a blind turn, but really I would think the bigger danger is from other cyclists. I can hear them coming from half a mile away whereas one cyclist may not hear another at all due to the noise of his own machine. For almost two miles I followed the dirt Pine Valley Rd, sharing the road with the six cyclists I'd seen at the TH. There were a number of places off to one side of the road or another that had inordinate amounts of broken glass, evidence of the common melding of the triumvirate of recreational pursuits - riding, drinking and shooting - in no particular order. Beta I had from Brian had indicated the South Slopes were less brushy than those on the north and east sides. Flush with my success on Buckman, I took note of a use trail leaving the main road just south of a saddle and before the junction with the Bear Valley Loop Rd. This use trail, obviously though infrequently used by cyclists, headed west into a shallow drainage before climbing gently out to contour to the south around Long Valley's east side. I found a fainter trail heading upwards when I got around to the southeast and began following that. At least one cyclist had attempted it as well, but it did not get very far before giving up. The trail devolved into nothingness soon afterwards as I found myself doing some light bushwhacking in order to reach the summit ridge. Once on the ridgeline I had a good view of the summit still some 900yds to the NW. The scrambling along the ridge was made interesting by the necessity to avoid more brush, but thankfully a path without much trouble was not hard to find. Just before reaching the rocky South Face a saddle is reached. The easier route follows up the ridge to the right, avoiding the cliffs on the South Face and goes at class 2 (I used this on the descent). I decided to check out the South Face for what looked like several possible class 3 routes. As I was crossing a sloping section below the largest cliff face I noticed a red can lying on the ground further downslope. Guessing that someone had tossed the register off the summit in disgust, I went down to retrieve the can, finding only the one half of the nested pair. No sign of the contents were found. I then scrambled the left side of the cliff up easy class 3 rock and found my way to the summit immediately thereafter. The other half of the nested can set was still at the summit, oddly. No sign of the register contents save for a small block of wood that had someone's name carved in it from 1976. I left this with the two cans reunited, but of course it still needs a pencil and notebook. The views were nice on such a clear day, stretching across miles upon miles of prime chaparral country in all directions. Looking off the northeast side in the direction of the use trail I had used upon leaving the roadway, I noticed another fainter trail cut through the chaparral higher up. I couldn't see where it led to, but it seemed to come up to the saddle on the summit ridgeline that I had passed by earlier on the SE side. It seemed worth investigating. Dropping off the summit to the saddle down the easier class 2 route, I found what looked like an old opening through the brush. Easy to miss if you're not looking for it - I hadn't even noticed it on my way up. I followed this down, hoping I wouldn't find it was only a partially cut trail or one that had become overgrown from disuse. Throughout the length of the trail there was evidence of much work someone had put in cutting the brush. It has been several years at least since it was cut or last maintained and I found some minor difficulty in following it downhill. In places the cut was quite good (this was the section I had seen from the summit), in others it was more haphazard as it went through much taller brush, following through the understory in a maze-like fashion. It was not clear whether the trail had been cut by a peakbagger or perhaps for illegal immigration - there are many such trails found south of the interstate and north of the border. Further down, the trail was in poorer condition, but I managed to find my way back to the original (and better) use trail I had used initially, eventually making my way back to the road. It would be harder to follow the trail in the uphill direction, I suspect, but if one were to follow the GPX track I used it shouldn't be too much trouble. Overall, I don't know if it's a better route that the one I took up the SE side (which I think was the route Brian recommended). It was 11:20a by the time I got back to the TH, making for just over 2hrs on the outing. This summit is found less than 4mi NW of Long Valley Peak, just north of the interstate and west of Pine Valley. The Pine Valley TH is found on the east side of the peak, a lonely spot compared to the Bear Valley TH. The two are separated by a short 5min drive.The Pine Valley TH is the northern terminus of a popular hiking route following down Pine Valley Creek through the Pine Valley Wilderness. The trail, creek and valley run under the Interstate just south of the trailhead. The impressive bridge spanning the canyon is said to be the highest in the entire Interstate Highway system. Just north of the TH at a bend in the access road is an unsigned horse trail that leads up and around the northeast side of Guatay Mountain between the communities of Pine Valley and Guatay. I followed this good trail for 8/10mi to where an iron barrier blocks the uphill fork at a trail junction. This barrier might prevent OHVs and horses, but is easy for hikers to walk around. This is the beginning of one of the unmaintained trails leading to the summit. Wide as it is, it must have been an OHV route at one time, now eroding slowly but still very serviceable. The trail climbs steeply until reaching the summit ridge, after which it becomes a more gentle, undulating route with only a few short, steep sections remaining. It goes on much longer than one might think it should, and though the views are quite nice the trail itself is strewn with loose rock and not terribly interesting. The summit is a rocky clearing among low chaparral, leaving the views open in all directions. A large box holds an ammo box, a pair of binoculars and other stuff. The ammo box itself is filled with worn registers, loose pages and somewhat trashy - none of the many, many entries went back very far. By far this was the most popular summit I visited today. It was after 1:40p by the time I returned, the second outing that came in at just over 2hrs. This P1K is located just south of Interstate 8 between the city of El Cajon and the much smaller community of Alpine. The entire north side of the mountain is part of a state ecological reserve while the south side has been developed over the years with a combination of rural horse ranches and newer, more upscale homes. The easiest routes are from the south but involve non-trivial trespassing. The longer approach is from the north starting at Flinn Springs County Park. There is $3 self-pay use fee to enter the park which I paid primarily because I actually had three singles in my wallet (there are places to park outside the park to save the fee for the more budget-conscious). The starting point is at the far west end of the park where there is a playground and several residences. It was a good thing I had paid because I had barely gotten out of the car when a plump, cheerful ranger drove up to check on me. She had the collection of pay envelopes with her to ensure payment compliance. She was very helpful in asking me where I wanted to go hiking, saving me some trouble in finding it myself. What looks like an off-limits service road is closed only to other vehicles. It crosses a creek before passing by several residences and then climbing higher to a couple of ball fields. A trailside information placard marks the start of the unmarked trail, really just a decommissioned dirt road. Shortly after starting up the route one passes through the boundary between the county park and the state reserve, marked by a simple sign. The trail continues with a few switchbacks, climbing about 800ft to a saddle leading to a high plateau area that forms the upper drainage of Rios Canyon. Homes can be seen not too far to the south with the summit rising another 700ft to the left (east). This middle region is filled with a network of motorcycle trails, their riders appearing to be the primary users. They are definitely not allowed lower in the county park, but I don't know if such use is permitted in the state reserve. None of the numerous junctions are marked so you have to have some idea where you're going. Just before reaching the area to the south with homes, I cut east on a side trail, crossed a small meadow and found the use trail leading to the summit. The trail is a good one though cross-country travel in the upper third of the mountain is not very difficult. The trail leads past a subsidiary summit with a cross atop it before climbing further to the highpoint. A register is located at a large summit rock with a benchmark, but this is not the highpoint. That honor goes to a fine-looking, smaller rock just to the west, a class 3 scramble by its easiest means. The summit views are similar to those I had from other peaks on the day with the added bonus of a really good view of rugged El Cajon to the north. So there is a nice clipped use trail on Long Valley now? Any bushwhacking? Just finished writing the report. See it for details, but there was little bushwhacking to contend with. Hey Bob! Taking heed of this entry, Avery Wear and I placed a new register atop Long Valley Peak when we hiked it this morning. I included a little "shout out" to you and your blog - don't worry. Also, I must request that you stop beating us to these great peaks in our own backyard. ;-) Thanks. Yes, it is a little wonderous how I peak bag like crazy in my backyard of southern California and Mr. Burd from the bay area has more summits here to his credit than I do.... -- he moves right along!